The unexpected, spontaneous and pleasantly disruptive nature of collective celebration is one of the great equalisers of social and political struggle. Credit: Sisters Uncut/Jade Jackman. All rights reserved. When you hear the words ‘anti fascist rally,’ what do you visualize? An angry crowd with placards, old hippies holding banners with clichés about love, or maybe those rowdy anarchists in black balaclavas? What about young women and non-binary people gleefully dancing to grime music that’s blasting out of portable speakers? Well, that’s precisely what a recent anti-fascist rally in south London looked like. It’s a perfect example of how collective joy can become powerfully subversive. When the far-right “pro-British” South East Alliance came to Croydon in south London to hold an “anti-immigrant, anti-Islam” rally, they were interrupted with an unexpected weapon: joy. A big crowd of young activists, predominantly from direct action groups like Sisters Uncut and Black Lives Matter UK, danced joyfully right in front of them, guarded by a line of police. It might seem like an unexpected tactic, but logically it makes perfect sense, both to the individuals involved and to the political goals of these groups. Where fascism aims to instill fear, joy is the perfect resistance. To laugh in the face of fear is possibly the bravest act, which is why Saffiyah Khan became an instant hero in the UK when she smiled at fascist thugs from the far-right, racist movement English Defence League—who began harassing Muslim women in her hometown. 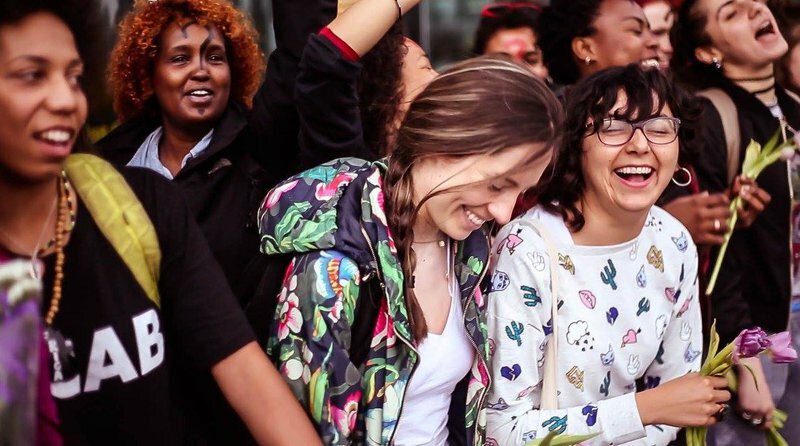 Two core tenets of fascism are fierce racism and rampant sexism, and with that in mind, anti-fascist resistance doesn’t get more powerful than women and non-binary people of colour collectively, loudly and happily dancing together in the streets. Dance as protest is not unique to Croydon. In April, LGBTQ activists in the USA held a “queer dance party” outside Vice President Mike Pence’s home to protest his homophobic policy positions. The global One Billion Rising movement, which aims to end violence against women, is centred on women dancing together on the same day in countries throughout the world. Sisters Uncut are renowned for collective dancing at their demonstrations against cuts to domestic violence services proposed or enacted by the UK government. Liberation movements have a long history of communal dance. The writer Barbara Ehrenreich has documented the history of collective joy in her book “Dancing In The Streets.” She argues that collective and ecstatic dancing is a nearly universal “biotechnology” for binding groups together. Physical movement—a powerful escalation of typical protest chanting—not only releases emotion, it also creates bonding, trust and equality, dissolving hierarchy and increasing a sense of community. What’s more, it’s actually essential to our survival. Our species, homo sapiens, has outlived all other human species because of our ability to co-ordinate with others in groups. Historically, groups who could hold themselves together through dance and other methods would have enjoyed an advantage over more weakly-bonded groups. In his book “The Righteous Mind,” social psychologist Jonathan Haidt describes the innate craving that people have to belong to a greater whole; to “transcend self-interest and lose ourselves (temporarily and ecstatically) in something larger than ourselves.” Haidt calls the ability to do this the “hive switch,” which makes groups more cohesive and more successful in relation to others. This switch can be activated at football matches and raves, through the use of hallucinogens like LSD, and even in choral singing or military drills. It has its roots in biology, since all of these activities release the “hug hormone” oxytocin which promotes social bonding. On an undeniably physical level, collective dancing has the power to generate a deep sense of elation, but at what point does collective joy become subversive? Within the context of capitalism, collective joy through dancing and other forms of expression is already subversive. Back in 1905, the German sociologist Max Weber warned of an “unprecedented inner loneliness of the single individual” that accompanied the “spirit” of modern capitalism. In a capitalist society founded on competition, privatisation and small family units, collective joy—as opposed to individual happiness—signals both personal resilience and political rebellion. The very act of relishing in a shared connection is a triumph in a society that seeks to divide us. The subversive power of collective joy is maximised when it occurs in public, politicised spaces as an affirmation of collective identity. Joy can score cultural and political goals in the name of liberation because it simultaneously serves an individual and a broader, political purpose. Many group activities are carried out in the pursuit of hedonist escapism, or in order to forget ourselves. However, when collective joy erupts in pursuit of defiantly reinforcing your very existence—especially in the face of those who seek to erase you—it has the power to subvert authority and release suppressed rage whilst connecting us to each other, and reinforcing a sense of group safety. There’s no better example of this process in action than Dabke dancing. Dabke is the traditional folkloric dance of Palestine, supposedly originating as a fertility rite where people stamped their feet on the ground. It is most commonly danced at wedding celebrations, but it can also be found in flash mobs on the streets of Gaza, as well as in BDS protests in New York. Right now we face a hostile world order that’s rapidly shifting to the right. The UK and the USA, supposedly bastions of democracy, both have leaders who ran for election with pledges to remove human rights and build walls; and who aggressively scapegoat migrants and valorize the military. Bearing in mind the 14 characteristics of fascism established by political scientist Lawrence Britt, these measures signal that there are even bigger battles to come. But the fight-back need not be joyless. Holding onto and centring joy is a vital tactic for personal and group resilience, as well as political resistance to an agenda that seeks to enforce hierarchy and division through mass fear. Authoritarianism is directly incompatible with collective joy; it demands fear, obedience, hierarchy and an obsession with security and preparation for war. The unexpected, spontaneous and pleasantly disruptive nature of collective joy takes people off guard and is one of the great equalisers of social and political struggle. “If I can’t dance, I don’t want to be in your revolution” as Emma Goldman, the Russian feminist anarchist, once famously said. We’d do well to take her words literally. Movement builds movements.